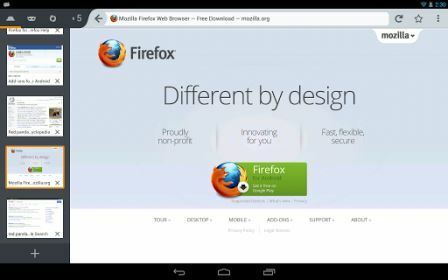 Download Firefox 21 for Android: Based on the Holo theme, the browser fire fox brings some news: The new version of Firefox for Android brings to the user the ability to save multimedia files via a long press, it can also access the history page through a long press on the Back button / Forward. But actualization also brings an interface for devices based on more refined Holo theme. The application also includes a number of performance improvements related to graphics, as well as changes selection CUSS-moz-user-select: none to improve compatibility with-web kit-user-select: none, show notes second official version disclosed by the website. In addition, the software also introduces changes for developers, including the deployment of remote profiles, integration Charger Add-on SDK and API libraries in Firefox, and the implementation of the DOM / content to <input type = ‘time’> . Download the browser by Clicking Here, it’s free, and either version of Android, as the space required will depend on the smartphone model.